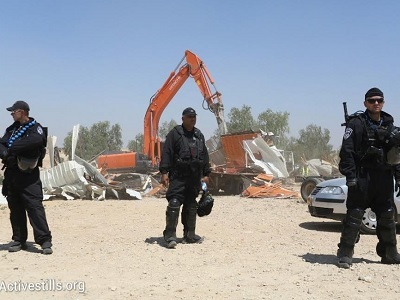 Meanwhile, in Atir in northeastern Hura in the Negev, bulldozers escorted by Israeli police demolished a home in which a family of 12 had been living. Ibrahim al-Afinsh, who owned the house, said the people of Atir and of the Negev would never give up their rights to their lands. The activist said that demolitions in al-Araqib continue to take place, even after the Israeli Higher Court of Justice ruled that al-Araqib’s lands do not belong to the state. He said that local Israeli authorities, who dispute the ruling, have filed a lawsuit demanding the court to order residents of al-Araqib to pay a daily fine of 5,000 shekels. Abu Mdeighem added: “Israel is celebrating its independence by demolishing our homes,” referring to Israeli “Independence Day” which Israel celebrates on Apr. 23 this year based on the Hebrew calendar. Palestinians will commemorate the same creation of Israel in 1948 — known among Palestinians as al-Nakba, the catastrophe — on May 15, according to the Gregorian calendar, remembering the violent expulsion of approximately 750,000 Palestinians from the newly created state. This includes 90 percent of the Palestinian Bedouins who had until then lived in the Negev Desert. Israel confined the remainder to a closed reservation. Demolitions, in addition to denial of basic services and access to infrastructure, are part of an ongoing campaign by Israeli planning committees against Bedouin villages in the Negev desert, where roughly 70-90,000 people live. In May 2013, an Israeli government committee approved a draft bill setting a framework to implement the evacuation of “unrecognized” Bedouin villages in the Negev, most of which existed before the state of Israel. 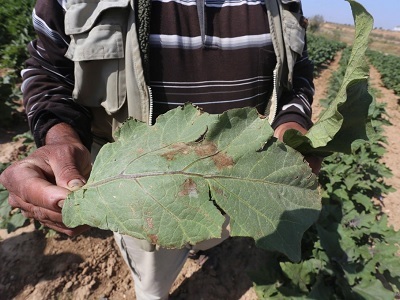 Both Al-Araqib and Atir are among some 40 Negev villages that Israeli authorities have deemed unrecognized, arguing that the 53,000 Palestinian Bedouins living in them cannot prove land ownership. Some 100 homes in unrecognized villages have been demolished since the beginning of 2015, while Israeli authorities have issued demolition notices to hundreds of others.